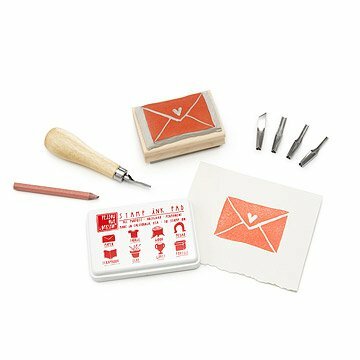 This kit contains all you need to carve your own ink stamps for homemade cards, gifts, scrapbooks and more. Rubber stamps are an easy way to make your own cards, gifts, decorations and more―but just imagine how much more personal it is when the image you're stamping is your very own creation! This set contains all the supplies you need to make your own, one-of-a-kind rubber stamp. The hand-assembled, two-sided stamp block comes with the carvable stamping surfaces pre-attached, and comes with the tools you need to create your design. An all-purpose ink pad is included, as well as simple, step-by-step instructions. There are even 25 design templates to get your creativity going, and a keepsake muslin bag to store your tools when not in use. Made in the USA. I'm an experienced stamp carver and would definitely recommend this for anyone just starting out. You get everything you need in one little box! The only thing I wish was different about it is the carving nibs. They're not as sharp as Speedball knives and it's harder to get them into the handle. If you want to do more fine details, definitely pick up a Speedball set. My nephew, an Eagle Scout, did a stamp course this summer. He's very excited about using the kit to create a unique stamp for himself. Great value for the price, which I highly recommend as a gift. my daughter is excited to create her own stationary now!